When a loved one serves in the military, every family member is impacted, especially children. Growing up in a military family requires children to adjust to constant change, frequent moves, and disruptions to their relationships. Moving is less about a new location and more about making new friends. As a former military kid and now raising our military children, I am quite aware of how a military parent impacts the entire family. Our children have spent their whole lives living in communities outside of a military base. Unfortunately, our decision means placing our children in schools and communities not always familiar with how to help military children adapt. My responsibility as a military spouse and parent has been to help educate our church family, teachers, and community on strategies to support our children. There are almost 1.4 million children in the U.S. between the ages of 4 and 18 with a parent serving in the military. More than 80% of these children attend U.S. public schools. More than 2 million children have a mother or father who has served in Iraq or Afghanistan, often multiple times. Students with a parent on active duty move three times more frequently than children of civilian families. So how can you help? 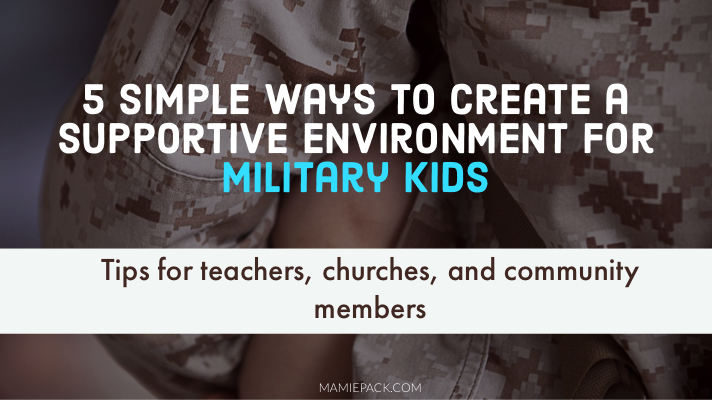 These five simple ways help provide a supportive environment for our military kids in your classroom, churches, or community. As an educator, church body, or community member, it’s okay if you don’t understand military life. You don’t have to walk in the shoes of our military kids to show them the compassion, offer understanding or create a supportive environment. As civilians (nonmilitary personnel), you can make a difference in the lives of military children and family by how you respond. Ask the parent and child how you can help. Include the parent as much as possible when helping the child adjust to a new school, extra-curricular group, or community activity. Extra-curricular activities are an excellent way for military children to find where they fit in new environments. From sports to bible study groups, military children will thrive when they can connect with activities that are meaningful and fun. Military parents new to the area will not be familiar with the local sports, deadlines or even ways to get their kids involved. Provide as much information as possible as soon as possible. Showing up consistently is a big deal in the lives of military children. After moving to a new town or while one parent is deployed, children can often feel they are no longer important or relevant to their family, school, or community. Taking time to make the phone call, send the letters, visit, or do weekly Facetime chats have a tremendous impact on providing a stable, supportive environment for military children, especially when they have moved to an area where they are new. Plan how you will keep in contact with the military child. How often? What form of communication? The goal is consistency. Some days are hard for military kids. They often feel big emotions but struggle with how to communicate them or process them. It’s not surprising when these kids end up acting out or completely shutting down. As teachers, church members, or community, you can help these children with embracing their emotions. Help provide them with healthy ways to respond to their feelings. Allow military children to ask the hard questions and answer them as transparent and straightforward as possible. Talk to the military child in a way he/she will understand. Use age-appropriate language and examples. If you want to provide a supportive environment for military kids, don’t try to push them into too many new things at once. A new move or a parent recently leaving for deployment along with a new school is stressful and a lot to process. Don’t be surprised when military kids fight to maintain any sort of normalcy. It might be eating their favorite meal five days a week or wanting to wear their favorite shirt almost every day. As a family member or a part of the community for the military kid, create space for the military kid to adapt to their new environment. If the favorite activity for the military kid was playing basketball at the local court, help him find a safe basketball court or invite him to play basketball. Military children are a quite resilient. When teachers, churches, and community members partner with parents military children win. They are able thrive in an environment where they are seen, valued, and belong. Thank you for helping! This is great advice & sorely needed. Its important to be mindful of these things. Our military children are such a wonderful group. They need us to understand and help them navigate their world. As a teacher, this was a great reminder for me to show compassion and patience with students from military families. Thanks for sharing! Wow i never knew how hard it could be but i really appreciate these tips to make it an easy transition. Thanks for sharing! Transitions can be challenging for the entire family. Most people want to help, they just don’t know how. Great Article. My husband just retired after just over 20 years and we have middle schoolers. They moved so many times and went through a lot. The support system we were able to have with local friends that we made and they were able to have at the different schools made a big difference. Thank you all for your service! Community supports makes such a difference for everyone. I love reading about military families. You mamas really do get an extra gold star in my book because you have to go above and beyond for your kids to make sure they’re happy and well-adjusted. Oh, thank you Shelby. There are a lot of sacrifices that happen within a military family. Having support within our communities, churches, and schools help tremendously. We live in the Augusta, GA area, which is home to Ft. Gordon. I’m so glad to have this resource so I can be more of a support to the military kiddos in our church and community. Yay! I am glad you can use it to help provide support to these great kids. Even small steps make a big difference in helping them succeed. As a fellow military spouse with a daughter of my own, thank you for this! God bless military families and the children who handle experiences beyond their years! Yes Lexi! Thank you and your family for your service. I love these tips. It’s so important to be mindful of military families no matter the setting you are in. Yes Amanda! Every bit of support and encouragement goes a long way. I was with a man for a few years who was in the military, he has a son who lived with his mom because it was hard for both of them to adapt to uncertainty of his profession. More so because he was an engineer and they had more global training. Unfortunately, it is common for children to end up with one parent, a grandparent or other family member because of the demands of the military career. It is really quite sad. It’s important to remember that military kids don’t have a “normal” life. No they do not. What is normal is embracing every could change. It definitely teaches you to be present and embrace the moment. Great tips! I never really thought about how communities may not know how to help military children adjust. This would be a great post to show them to get them started in the right direction! Thank you Jennifer! Learning how to help our military communities helps tremendously. Even little things like saying , “Thank you for your service” matters. Such a great list Mamie you put together. It’s very important to teach kids discipline from the early age. Normally military kids’ life is little out of normal as I have cousins and growing up realized that it was little hard for them to move so many times and adjust. Wonderful post! BTW nice to meet you here on your blog and welcome to blogging. If you need any help please don’t hesitate to reach out. Our blogging community is very helpful. Oh, thank you for connecting with me! The journey is sweeter with others.